I knew from the moment that I started the "Naughty and Nice" project that I wanted to do a spiral noodle soup in some form. I did a lot of research into what jarred soups people had made and what recipes there were to choose from. 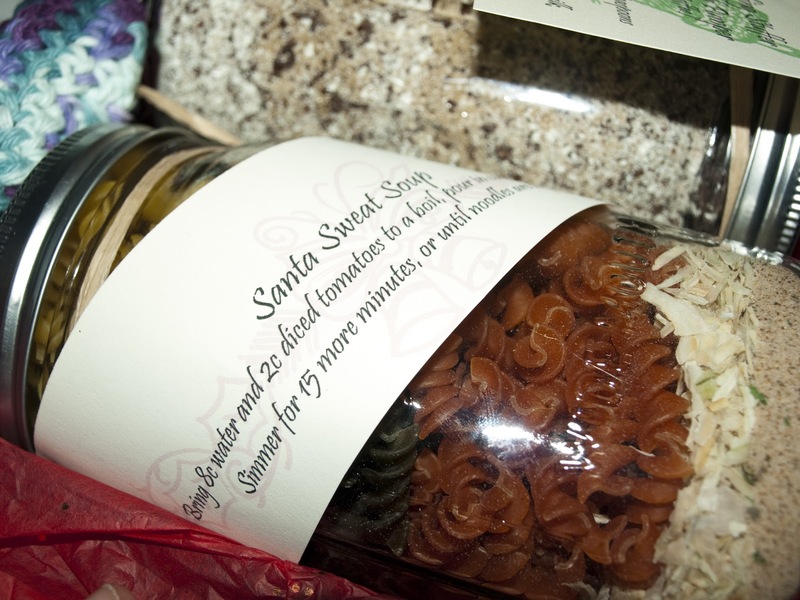 Armed with all of this knowledge, I used the basic form from a couple of different recipes to design my "Santa Sweat Soup" to be included in my "Naughty" packages. Here is the way to make it, I hope you enjoy! Mix all the powders together to blend, and add to the jar using a canning funnel. Decorate the Jar with fabric, stickers, or tie a ribbon around the top. Include cooking instructions and gift away! Bring water and tomatoes (and veggies if desired) to boil in a soup pot. Add the Jar of Soup mix and simmer for about 15 minutes or until noodles are tender. Garnish with crackers or Parmesan cheese.